Upon our arrival at Heathrow, my girlfriend and I took a bus to stay with a friend living and working in Oxford. Before the bus ride was over I immediately knew I loved this college town. I say college town but really should note that Oxford feels like ancestor of all college towns that have sprung up in the past seven centuries or so. Every building in town explodes with history, and the urban landscape is a mix of town and college buildings. Most of the college quads do not allow visitors or charge a fee, but we did enter Wadham College and walk its grounds. The main college building was built in the 1610s and is a beatuiful sight to behold. It is made for learning, study, writing, and thought. I didn’t want to leave. 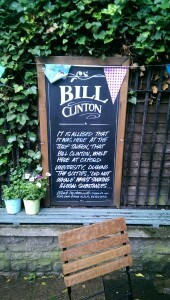 No trip to Oxford, much less England, would be complete without visiting some of the country’s pubs. One that I particularly enjoyed was the Turf Tavern, located next to a portion of the 13th century city wall. The tavern was founded outside the medieval city as it was frequented by gamblers and other questionable characters. 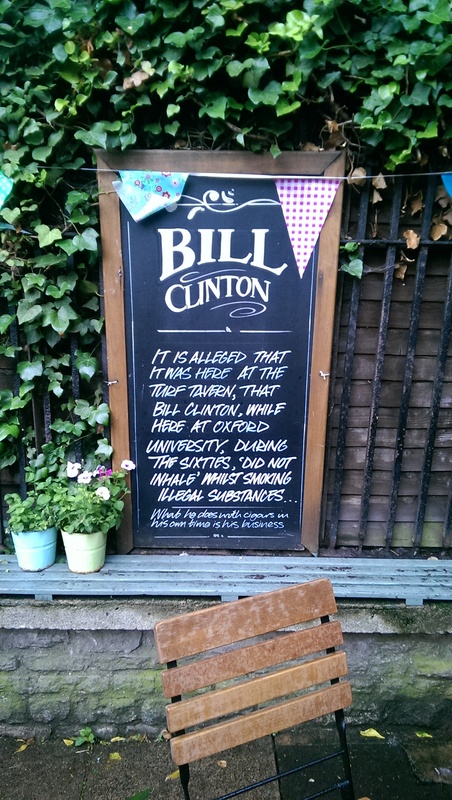 According to tavern legend, it was at the Turf that Bill Clinton “did not inhale” while he was a Rhodes Scholar. Today, the crowd is mostly students but no less questionable; most of them appeared to be smoking tobacco. Oxford is home to some amazing museums. We visited three: the Ashmolean, the Natural History Museum, and the History of Science Museum. The Ashmolean houses archaology and ancient artifact collections as well as more recent art. A favorite object from this museum was a copy of Mryon’s Diskobolos. 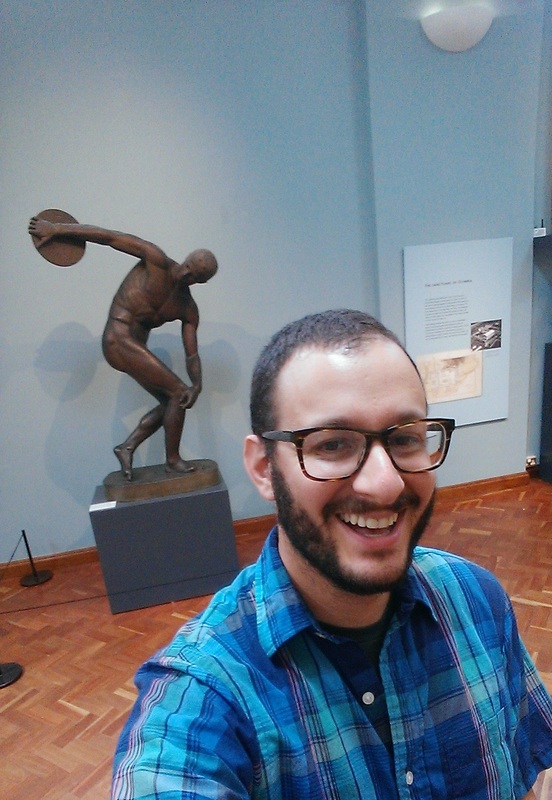 I liked it so much I took a rare selfie in front of it! The Natural History Museum was my favorite museum in Oxford (perhaps my favorite of the trip). Its collections are vast and incredible; the main hall houses one of the only preserved Dodos on display in the world in addition to dinosaurs, modern animals, and geological specimens. 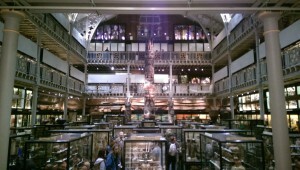 The museum also contains the Pitt Rivers collection, which is a lesson in museum studies come to life. Established by 19th century British general Pitt Rivers, the collection is really a series of collections, covering the entire world and spanning the full range of human activities from music making to war, religion, cooking, transportation, and clothing. 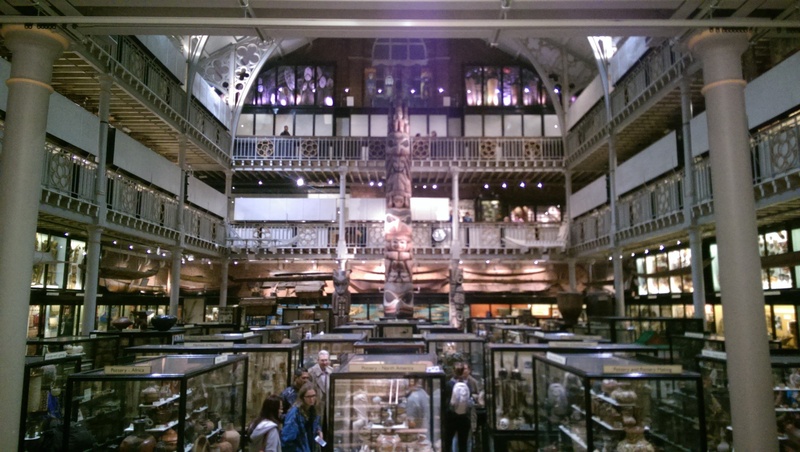 Entering the Pitt Rivers is like stepping back in time to the late 19th century, when museums were more like cabinets of curiosities and objects from different contexts were displayed next to each other. It is a visually striking and overwhelming room, with two balconies. I spent time walking around the entire collection but know that I could return ten times and still discover new things. This museum was used as an example in museum studies classes I took as an undergrad, and visiting it was definitely a highlight of my trip. The final museum we saw in Oxford was the History of Science Museum. Located in the oldest purpose-built museum building in the world, the collections consist mostly of scientific instruments from around the world. 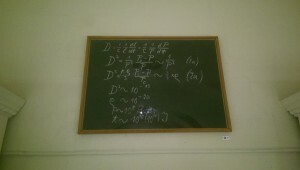 While small, this museum was also full of interesting objects, but my favorite was a blackboard that Albert Einstein used during a lecture he gave at Oxford in the 1931 (??). 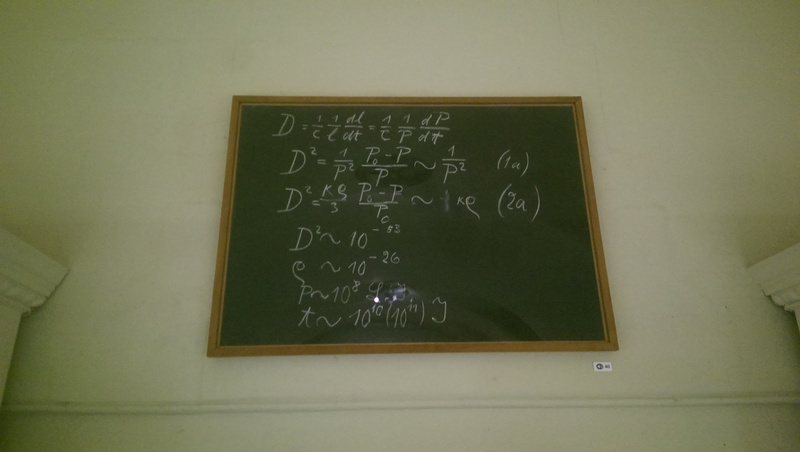 Containing just seven lines of mathematical proofs, it nevertheless allows the visitor a tangible connection to one of the most influential thinkers of the 20th century. After a lovely weekend in Oxford we headed by bus to the capital. London. On a grey Monday it rose up before us on the horizon, visible from the top deck of the bus. Our base of operations was an airbnb in Clapton Pond, a neighborhood in the Borough of Hackney. 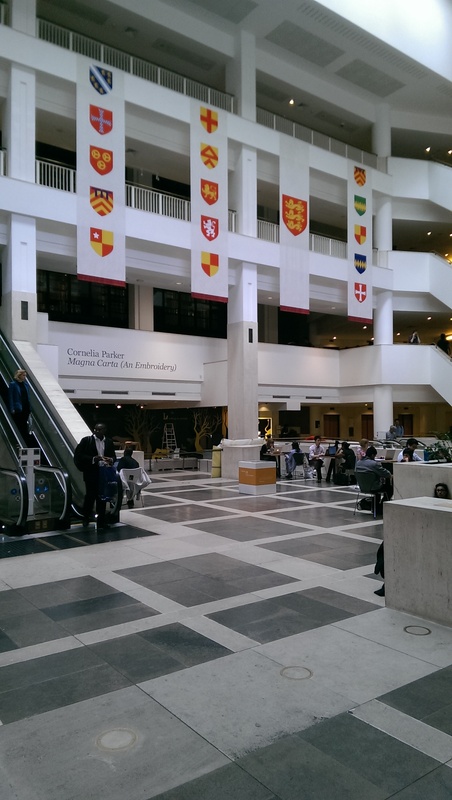 It was an excellent place from which to explore the city and experience a range of London beyond the downtown, touristy areas. We visited lots of sights, markets, and pubs from Chelsea to Shoreditch, Kilburn to Camden, and Westminster to Trafalgar Square. One of my favorite places we went to was the Tower of London. Once the riverside castle from which English kings and queens projected power, today the complex continues to serve as a home for the crown jewels, military units, and some government officials. It was an amazing place to see. 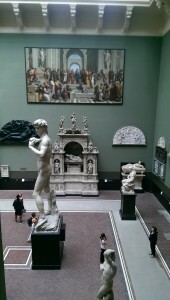 I also particularly enjoyed the Victoria & Albert Museum. This museum, established during the reign of (you guessed it) Victoria and Albert. The musuem houses an incredible art collection, specializing in design and practical objects. Gallery after gallery of furniture, pottery, and clothing greeted us as we navigated the sometimes confusing passages of the museum. We ended our visit in the sculpture gallery where plaster reproductions of art, buildings, and church interiors were originally displayed for the benefit of students and citizens who could not study photographs of these pieces. 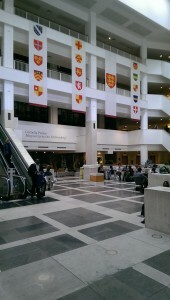 Near the V&A, we popped in to the British Library. I considered trying to get a reader’s card and peruse some ancient manuscripts but thought better of it when I considered that my traveling companions would probably be at dinner on the other side of town when I finished at the library! Instead, I checked out the library’s permanent exhibit of some of its most incredible treasures, including a Shakespeare folio, early maps of British explorers, and Paul McCartney’s annotated lyric sheets. Add this one to the list of places to spend more time on my next visit. 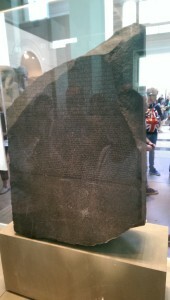 The final London spot I will highlight is the British Museum, which we visited on our final weekend in town. This is another place I could spend all day but with so much to do, we only had a few hours in this huge museum. I did manage to see most of the prominent objects, including the Rosetta Stone and Parthenon Marbles. Even through the throng of people crowding around these objects, it was incredible to be in their presence. I almost forgot that these things were taken from the countries in which they were found and brought to London for display in the capital of the largeset naval empire in the history of the world. But the stuff was really cool! OK, I’ll stop now before I post every picture I took in London. It was truly an amazing place and I can’t wait until I have the opportunity to go back. Until next time, cheerio!